Black Cotton Soil (BCS) collected from Guyuk, Adamawa State- North-eastern Nigeria, was treated with 0 to 100% Reclaimed Asphalt Pavement (RAP) in 10% steps to evaluate the microstructure and strength of the compacted mixtures. The index property results show that the BCS and RAP are classified under clay of high plasticity (CH) and poorly graded sand (SP) respectively, according to the Unified Soil Classification System (USCS). An extraction test gave a RAP bitumen content of 5.99%, which is within the value of 5–6% recommended in the literature. An x-ray diffraction test carried out on both the BCS and RAP showed that the BCS predominantly consisted of quartz, microcline, albite and kaolinite, which is similar to the results obtained in the literature, while the RAP, however, consisted of quartz, albite, orthoclase, phylogopite and actinolite, which is slightly different to what is reported in the literature, probably due to the source of the bitumen. The results of compaction, at a modified energy level, conducted on the mixtures, show that the Maximum Dry Density (MDD) increased from 1.890 to 2.034 mg/m3 at 30% RAP content, after which the value fell to1.925 mg/m3 at 100% RAP content. The Optimum Moisture Content (OMC) however, decreased from 13.7% at 0% RAP, to 8.8% at between 40-60% RAP content, after which the value increased marginally to 9.5% at 90% RAP. Similar to the MDD, the California Bearing Ratio (CBR) increased from 11% at 0% RAP to a maximum of 35% at 30% RAP content, after which the value fell to 5% at 100% RAP content. 30% RAP is therefore the optimal mixture giving the highest strength and can be used as a sub-base material for roads with light traffic use, according to the Nigerian General Specification for Road and Bridge Works. Hence the 3.07% bitumen obtained for this mixture can be adopted as the fixation point for BCS-RAP mixtures. Durability was found to be far lower than the resistance to loss in strength of 80% suggested in the literature. 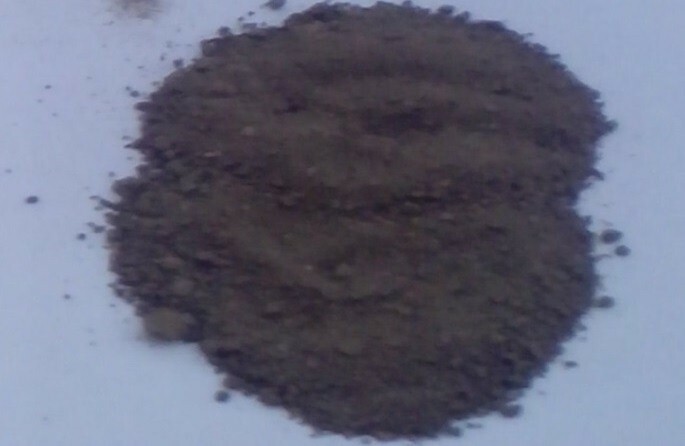 Black cotton soil (BCS) is a problematic clay soil found in many regions of the world, including Nigeria and India. Its problem stems from its potential for expansion in the presence of moisture, and for shrinkage with subsequent loss of moisture. This behavior usually results in the failure of light structures placed on it. These properties are as a result of montmorillonite and and smectite clay minerals in the soils (Ola, 1974; Osinubi, 1999; Ogundalu & Oyekan, 2014; Kaushal & Gulerie, 2015). According to Gidigasu and Gawu (2013), black cotton soil is found in 254 million hectares of the ice-free part of the world, of which 72 million hectares are in India. The large area covered by this soil in the north-eastern part of Nigeria makes it necessary for long stretches of roads to be constructed over the deposit. This usually results in early failure of the pavement structure because of the expansion and shrinkage of the subgrade black cotton soil. The long distances involved in obtaining better replacement soil material in this region make road construction costs high. In order to avert the damages caused by BCS, much research has been conducted to modify or stabilize the soils using various chemicals to improve its physical and geotechnical properties. Some researchers (Ola, 1974; Osinubi, 1999; Gaikwad et al., 2014) used lime to either modify or stabilized the soil, resulting in improvement in its physical and to some extent, geotechnical properties. Other researchers (Naik & Chandrashekhar, 2000; Modak et al., 2012; Hakari & Puranik, 2012; Ramlakhan et al., 2013; Mudgal et al., 2014; Patel & Mahiyar, 2014; Rajput & Yadav, 2015; Mir, 2015) worked on the admixture stabilization of BCS using mixtures of lime, fly ash, rice husk ash, sugarcane bagasse ash, electric arc furnace dust and stone dust. These materials were used individually and mostly in conjunction with lime to improve the physical and geotechnical properties of the soil. All these authors recorded a measurable improvement in the properties of the BC soils. The mechanism behind the use of these chemical stabilizers is that lime possesses a substantial amount of calcium oxide, which reacts with the pozzolanic ashes that contain a high level of amorphous silica to form cementatious calcium silicate hydrates. These, apart from causing flocculation of the clay particles into silt-sized particles, cement the resultant particles together to form a solid mass. These processes help to modify the soil and even increase the strength of the stabilized black cotton soil. Reclaimed Asphalt Pavement (RAP) is asphalt removed from failed road surfaces for the purpose of maintenance or reconstruction of the surface (Mustapha et al., 2014). While this material is reused appropriately in most developed countries, in developing countries such as Nigeria, it is thrown away indiscriminately and allowed to degrade the environment. RAP contains aggregates which can improve the stability of deficient soils and bitumen, which gives adhesion to soil particles and hence contributes to the strength of the soil. The use of RAP to stabilize soils has the double benefit of protecting the environment and using waste to generate wealth. Many studies have been carried out on the possible use of RAP to improve the physical and geotechnical properties of deficient soils. Suebsuk et al. (2014) studied the effect of RAP on the compaction characteristics and unconfined compressive strength (UCS) of cement-treated soil – RAP mixtures. They adopted porosity as a state parameter for assessing the strength of the mixed material. Their results showed that as RAP content increases, the OMC tended to decrease to an optimum soil-RAP ratio of 50/50. The asphalt fixation point was recorded to be at an asphalt content of 3.5% (50/50 soil-RAP ratio). Rupnow et al. (2015) conducted a case study on the stabilization of a RAP-soil mixture with class C fly ash for use as a sub-grade. They used a Dynamic Cone Penetration (DCP) test to evaluate the strength gain in the field. A UCS test and consolidated undrained triaxial compression tests were carried out in the laboratory. The DCP test results show a time-dependent strength gain due to the cementing and pozolanic action. The falling weight deflectometer results show increased pavement durability and performance. Li et al. (2008) studied the case history of the fly ash stabilization of RAP material. They used an existing hot-mixed asphalt base and sub-grade to depth of 30cm to form Reclaimed Pavement Material (RPM). The RPM blended with 10% fly ash by water was compacted and used as a new pavement. CBR, resilient modulus (Mr) and UCS tests were conducted on the SRPM prepared in the field and in the laboratory. The results showed laboratory CBR ranging between 70 and 94%, Mr between 78 and 119 MPa and UCS between 284 and 454 kPa. The results of the unstabilized RPM show CBR between 3 and 17%, and Mr between 46 and 50MPa. In-situ falling weight deflectometer testing conducted after one year of construction revealed that the pavements had not deteriorated. Edeh et al. (2012) studied the reclaimed asphalt pavement-lime stabilization of clay as a highway pavement material. They obtained an unsoaked CBR of 36.56% and a 24 hour soaked CBR of 34.23%, concluding that the material could be used for sub-grade and sub-base courses. A study of the use of RAP materials in flexible pavements was carried out by Mishra (2015). Compacted density ranging from 1.500g/cm3 to 1.950g/cm3 was observed, while the asphalt content ranged from 5-6%. The CBR of 100% RAP ranged from 20-25%. Stabilization of lateritic soil using RAP and sugarcane bagasse ash was studied by Joshua (2014), who observed that the MDD increased from 1.771 mg/m3 for natural lateritic soil to 1.79 mg/m3 at 40% laterite-60% RAP. Kamel et al. (2016) worked on an evaluation of the suitability of RAP for sub-bases, and from an extraction test observed the bitumen content of RAP to be 5.09% and maximum CBR to be 61.2% in a 50% soil-50% RAP mixture. Recycled Concrete Aggregate (RCA) and Mixed Recycled Aggregate (MRA) were studied by Garach et al. (2015) using Scanning Electron Microscopy (SEM) and X-ray Diffraction (XRD) for possible use as road pavement material. The XRD showed a significant proportion of dolomite, chlorite, calcite and quartz in both the RCA and the MRA. The SEM pictures showed brick and calcium silicate. SEM images of RAP and fly ash (FA) as well as the XRD for RAP and FA, were presented by Hoy et al. (2016). The XRD of RAP contained calcite magnesium, dolomite, quartz, hematite and mulite. The aim of this research, therefore, is to study the microstructure and strength of compacted mixtures of BCS and RAP, with the objective to use RAP, which is a waste product, to stabilize highly soft and expansive BCS. (1) The BCS studied is classified as A-7-6 and CH based on the AASHTTO and Unified Soil Classification systems respectively, while the RAP studied is classified as A-1-a and SP based on the same systems; (2) A maximum MDD of 2.036 mg/m3 was recorded at a mixture of 30% RAP–70% BCS. The microstructural images of the compacted specimens from SEM reveal the best particle interlocking arrangement in this mixture; (3) A maximum CBR of 35% was recorded at 30% RAP –70% BCS. This value is above the 30% minimum recommended by the Nigeria General Specification for Roads and Bridge Works (1997) for soil material to be used in road sub-base; (4) The durability of the RAP-BCS mixtures was observed to attain a maximum value at 40% RAP-60% BCS. However, all the values recorded are below the 80%, suggested by Ola (1974); (5) Black cotton soil stabilized with RAP can be used as sub-base material for roads with light traffic based on the specifications of the Nigeria General Specification for Roads and Bridge Works (1997). However, care must be taken to prevent ingress of water into the sub-base, so as to avoid rapid loss of strength due to the lack of durability.